Tim Dowling: Knitting! ! ! 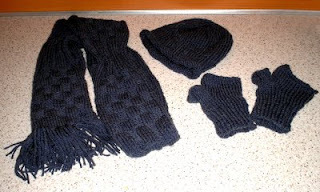 A few new knitted pieces, a beanie type hat, scarf and a pair of chunky finger-less gloves are a birthday prezzie for my friend Vince. He's 30 years old today!!! Finished just in time. I gave them to him last night and he liked them! It took me a long while to get my head around to knit the gloves, they are so DIFFICULT to knit if you're not going to sew on the thumb but I invented something new for myself to make that seamless look! A funny fact: the number of stitches I used for the scarf is 30 for the width. I don't know how many I used for the length...I just played by ear for that, also the gloves are a 30 stitch circle! I don't know, thought that might be funny....I forgot to tell him that though! I like the pattern -- it gives the scarf body and volume. It looks soft and lovely. Congrats on the great work! Gosh, your getting great at this Knitting thing... I need to get a side project. Must be very theraputic. Hey Tim, very impressed with the knitting, especially considering you taught yourself. Like the scarf pattern - I'm actually knitting a baby hoody with the same checkered pattern, it makes for a really nice finish. Grainne, thanks for the encouragement. Well, you did teach me a few tricks, you have to teach me a few more things when your back! ahem...Derm, what are you goin to do with that? ?